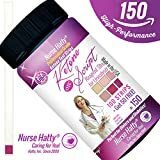 Nurse Hatty® - High-performance Ketone Strips. There is no better feeling in the world then the first time that strip turns a pinkish purple and you realize that you are in ketosis. Ketone strips are the easiest, yet also least specific, way to check your ketone levels. These are very simple to use, just urinate on the end of the paper strip and within seconds the tab will turn a color that correlates with the number of ketones in your body. 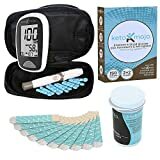 Keto-Mojo Blood Ketone and Glucose Testing Meter Kit. Blood testing is the most accurate way to measure to measure your ketone levels. This kit comes with everything necessary to get accurate reading every single time. One of my favorite things about this reader is that it also comes with internal storage that will save up to 1,000 tests so that if you are recording your macros in a food journal it is easy to compare against past tests and see what is having the most effect on your body.